Audi introduced the A5 coupe for the 2008 model year. The A5 Cabriolet, introduced for 2010, replaces last year's A4 Cabriolet, which was based on an A4 sedan from the early 2000s. (OK, I surrender. It will be "convertible" from here out.) The A5 convertible, related to the current A4, comes standard with front-wheel drive, a 211-horsepower, turbocharged four-cylinder engine, and a continuously variable automatic transmission. Quattro all-wheel drive and a six-speed automatic, packaged together, are optional. The convertible cannot be had with the coupe's 265-hp V-6, nor does it come with a manual transmission. Performance enthusiasts can step up to the S5 convertible, which pairs a 333-hp, supercharged V-6 with a manual or dual-clutch automatic gearbox. We cover the S5 separately on Cars.com. 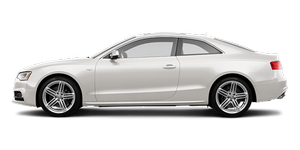 Click here for a comparison of the full range of A5 and S5 coupes and convertibles. We tested an all-wheel-drive A5 convertible.